Nicolas Maduro has told Euronews that an attempt to overthrow his government is "over" as he attacked the European Union for "blindly" following the politics of Donald Trump in backing his opponents. Maduro said National Assembly leader Juan Guiado, recognised as interim president by the US and most European Union nations, had been hoping to bring about a military coup but had failed to secure the army's support. "It was madness… they wanted a military coup. But they failed. They were playing that card. But it’s over," he told Anelise Borges in an interview at the presidential palace in Caracas. Maduro has been locked in an overt confrontation against the opposition for the past two weeks since the National Assembly declared his latest election victory as invalid and proclaimed Guaido as a caretaker leader until new elections can take place. 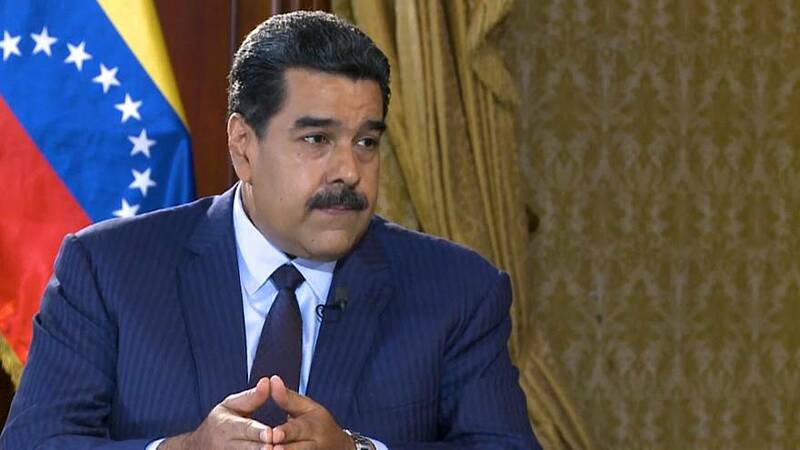 Speaking about the decision from European nations to follow suit from the National Assembly and recognise Guaido as interim leader, Maduro said: “I believe that Federica Mogherini [the European Union's foreign affairs supremo] and EU governments have made a huge mistake." "I believe Europe has been blindly associating itself with Donald Trump’s bad politics. Trump’s politics have discarded NATO, EU governments, and the EU." "They have listened to only one side, they’ve paid attention to only one side. They didn’t listen to the entire country that wants dialogue, understanding, respect." "And [they] didn’t listen to us who have a voice of true power. I believe Europe has been blindly associating itself with Donald Trump’s bad politics." Explained: Is it legal for Guaido to be declared president? Which countries back whom in the Venezuelan power struggle? Amid the crisis, Venezuela has also seen a max exodus of its citizens. Should the current rates of emigration continue, 1 in 6 Venezuelans will have left the country by the end of the year, the UN has warned. But Maduro remains steadfast in his position. “If I didn’t understand the situation in my country I wouldn’t be president- elected and re-elected," he said. "I understand because I come from the people. You must know I didn’t study in Harvard or in another American school. I don’t have an important family name, noble blood. I am a worker. And I spend all of my days close to the people. I know exactly what’s happening."